In ancient Greece and Rome an ambiguous relationship developed between man and nature, and this decisively determined the manner in which they treated the environment. On the one hand, nature was conceived as a space characterized and inhabited by divine powers, which deserved appropriate respect. On the other, a rationalist view emerged, according to which humans were to subdue nature using their technologies and to dispose of its resources. 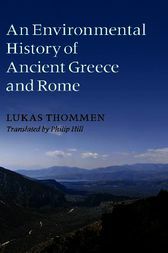 This book systematically describes the ways in which the Greeks and Romans intervened in the environment and thus traces the history of the tension between the exploitation of resources and the protection of nature, from early Greece to the period of late antiquity. At the same time it analyses the comprehensive opening up of the Mediterranean and the northern frontier regions, both for settlement and for economic activity. The book's level and approach make it highly accessible to students and non-specialists.